There's something about the combo of sweet roasted beets with creamy, tangy goat cheese; it's so good, you almost forget you're eating a salad. Throw in some cool, crunchy cukes and you've got yourself a party. Roasting the beets really concentrates their flavor, which goes beautifully with the balsamic vinegar. This recipe calls for a lemon cucumber, which is yellow and shaped like a lemon. We love it because it's mild and almost sweet, never bitter. Enjoy this salad as a side dish as is, or add a handful of your favorite greens to make it into a full meal. 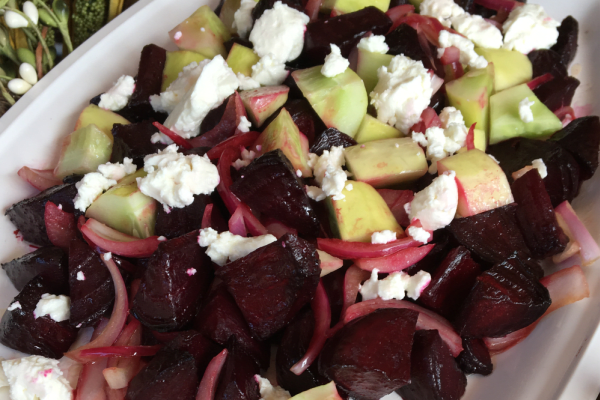 Go crazy at the farmers market and sub in other varieties of beets or cucumbers: candy cane beets, golden beets, English or heirloom cucumbers. Vegan? Replace the goat cheese with toasted pumpkin seeds. Per Serving: 131 calories; 8g fat; 10.8g carbohydrates; 4g protein; 7mg cholesterol; 363mg sodium. This is a fresh, earthy salad that has a lot of flavor. We also added toasted pumpkin seeds for some extra crunch. I made this recently and really enjoyed it. The beets and goat cheese are definitely the standout ingredients in this dish. The white pepper adds a nice spice to it too. I love the flavors overall, and will probably make this again for Easter.